Twelve years ago, Jay patiently taught me how to ski. I had gone a couple times in my life before that, but he took the time to really get me going. I still look like a drunken ogre awkwardly sliding down the mountain, but at least I can get down most slopes without falling and I can enjoy it. We’ve spent a LOT of time riding a lift together since then, but after I moved away in 2006, those chats got cut way down. This past weekend, he came out for a visit and we spent three straight days skiing. The difference between now and 12 years ago is, well, 12 years of aging. We’re not as young as we used to be and we were reminded of that with each run. Jay’s original plan was to come ski Thursday through Saturday. That ended up getting changed to Saturday through Monday and it’s a good thing because it rained all the way to the top of the mountain on Thursday. On Friday night, it dumped snow and we had about 10″ of fresh snow on Saturday. We spent the day at Crystal and had a great time with some pretty good powder runs. Day 2 was also at Crystal, and even though there wasn’t any fresh snow, it had stayed cold since the previous one so it was still fluffy and fun. With Jay skiing beside me, I finally explored the Right Angle Trees run. It’s a very infrequently skied double black diamond area that I’m hesitant to explore without a partner. It took us a while to pick our way down the run but there was literally nobody else around. At one point we just plopped down on the side of the hill for five minutes and enjoyed the silence. I always take Jay to Crystal when he comes because it’s my favorite ski hill, but I figured it would be fun to show him something else. 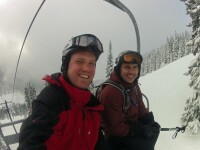 We headed to Stevens Pass for our third day of skiing. This was a Monday so the crowd was very small. There were maybe a couple inches of fresh snow and we found a couple spots off the runs that were still deep and fresh for a few turns. I owe big thank yous to Jay for flying all the way out here, and to Juliet and Tyla who watched our kids the whole weekend while we played. That’s a lot to ask and without them, this wouldn’t have happened.